Senegal international Khadim Ndiaye suffered a horrendous double leg break while in action for Horoya AC, and the extent of the injury had a big impact on those around him too. 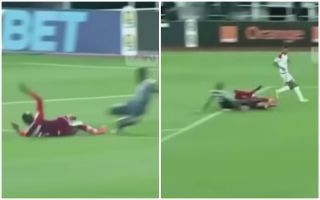 The injury happened on Saturday as the 34-year-old collided with a teammate, as seen in the video below, and he immediately rolled around in agonising pain. Horoya were in action against Wydad Casablanca in the African Champions League quarter finals, and as noted by The Sun, the injury even left referee Bamlak Tessema in tears. It’s added that a timeline hasn’t been provided as of yet on when Ndiaye will be able to return to action, but given it was a reported double break, it’s just hoped that he can make a successful recovery as swiftly as possible to get back to doing what he loves. “The results are reassuring and he will remain at the Cheick Zaidi University hospital where he will continue his recovery,” a statement from the club read. Naturally, not only for the referee, it would have been a horrific sight for his teammates too, and they’ll undoubtedly all be wishing him well and helping in his rehabilitation.